Christians are found of saying that God reveals himself in two books: the Bible,God’s special revelation, and creation, God’s general revelation. While there is some baseline recognition that ‘the heavens declare the glory of God and the skies proclaim the work of his hands’ (Psalm 19:1), Protestants are generally suspicious that we can apprehend or trust much truth ‘out there.’ Robert K. Johnston, professor of theology and culture at Fuller Seminary, and author of Reel Spirituality: Theology of Film in Dialogue, here tackles the issue of general revelation with God’s Wider Presence: Reconsidering General Revelation. Johnston sees ample evidence of God’s Presence in the world in nature, culture and even world religions; however this is not a capitulation to some sort of universalist pluralism, but an acknowledgement that God’s Spirit works in mysterious ways and places. 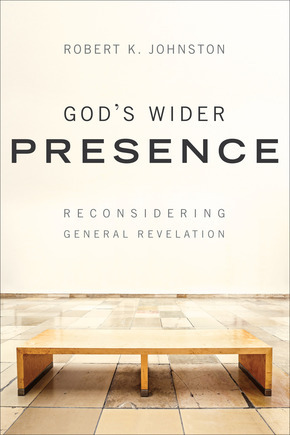 Rather than understand general revelation as any encounter with the Transcendent that occurs outside the believing community and that is not directly concerned with redemption, many have wrongly reduced it to a perceived ‘lowest common denominator’ by limiting ‘general revelation’ to those general truths that are communicated by God to all persons at all times and in all places” (8). This understanding plays out in our biblical theology as well, “Theology’s bias toward the redemptive over the creational, and toward the propostional over the narrative is perhaps the second explanation for the relative paucity of theological thinking on general revelation” (10-11). Thirdly, Johnston sees a dim view of human receptivity to divine revelation in much of conservative evangelical theology. Against these objections, Johnston suggests a way forward that invites a theological dialogue about “God’s revelatory Presence outside the church and without direct reference to Jesus Christ” (15). Johnston calls us to have a robust two-way conversation between Scripture and the theological tradition and the realm of culture and personal experience (15). The danger of self-deception, if not outright blasphemy, is ever present and must be taken seriously. . . As I will argue this is why it is crucial for one to have a full-orbed theological hermeneutic, a robust methodology that includes scripture, tradition, and community as well as experience. One does not whisper “God” by shouting “man.” The witness of God’s revelation in Scripture is authoritative and the testimony and reflection of Christians through the ages foundational. But the danger for Christians is also on the other side. We can exclude by an overemphasis on sin and salvation the real, revelatory Presence of God through his Spirit that is the clear testimony of the vast majority of Westerners today (37). These two chapters set the trajectory for the rest of the book. Chapter three looks at the experience of transcendence in film by Johnston’s film students (in a variety of styles of films). Chapters four and five illustrate how scripture itself testifies to the Presence of God outside of the covenant community. This includes the borrowing of sayings in Proverbs from Egyptian origins, Yahweh speaking through Pharoh Neco to ward Josiah off of battle. King Huram of Tyre sends Hurumbai as a skilled artisan for the construction of Solomon’s temple, Cyrus of Persia in Chronicles and Ezra is seen as God’s instrument, Additionally, Johnston highlights two creation psalms (19 and 29) that speak of the revealing nature of creation (and not just reflecting on the creation as described in Genesis). Other examples include Melchizedek, Elijah’s hearing God on Mt. Horeb, Balaam, various non-covenant peoples in the prophetic literature, Paul’s use of natural theology in Acts 14 and his use of Roman poetry and religion in Acts 17. He makes a strong case that the Bible leaves open the possibility of God speaking through unlikely vessels. In chapter six, Johnston engages the theological tradition. Johnston examines three different thinkers who were influential on twentieth century Christian thought and takes his cues from them on revelation. With Barth he affirms that natural theology cannot happen from below (recalling his famous answer to Brunner) but “that revelation always needs the Spirit as Revealer–it is event” (127); with Schleiermacher he affirms that general revelation is not accessible through rationality “but through an intuition of Something or Someone beyond us and our feelings that result from that encounter” (127-8); from CS Lewis he gets the idea that general revelation is more than just an insignificant trace in comparison to the glory of Christ but “an experience of the wider Presence of God through his Spirit mediated through creation, conscience and human culture” (128). In chapter seven Johnston tracks this wider Presence of God through the writings of John Taylor, Elizabeth Johnson, and Jurgen Moltmann. Taylor tackled the reality of real Spiritual encounter in the realm of experience in mission and world religion. Feminist theologian Elizabeth Johnson explored how the Spirit was “God’s livingness subtly and powerfully abroad in the world” (174). The social-trinitarianism of Moltmann, releases the Spirit from his subjectivity to the Son, acknowledging the Trinity as a co-equal community. This allows for more freedom for the ‘wind to blow where it may,’ and the Spirit to show-up outside of the tale of our redemption. The final chapter continues to examine the Spirit is at work in the realm of creation, conscience and culture.